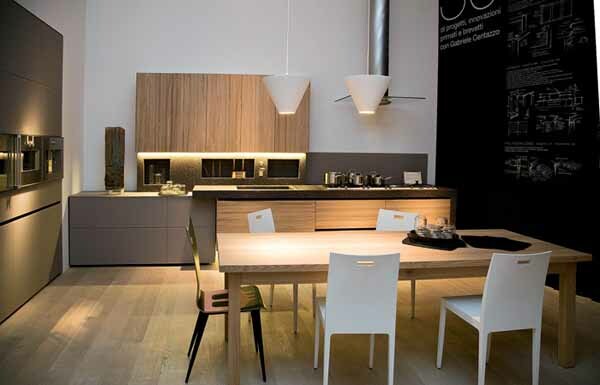 Modern kitchen design trends for 2013 reflect the growing popularity of cooking and eating at home. Saving money, improving health, having more fun and entertaining friends in homes, spending more time with families and love for homemade meals make cooking a hobby that requires professional, ergonomic, attractive and functional kitchen designs. Kitchen design trends 2013 are influenced by modern interior design trends that bring the interconnection and organic design into modern homes, changing perspectives and opinions about the good and organic food, proper eating habits and homemade meals, improving health, life quality and vitality. 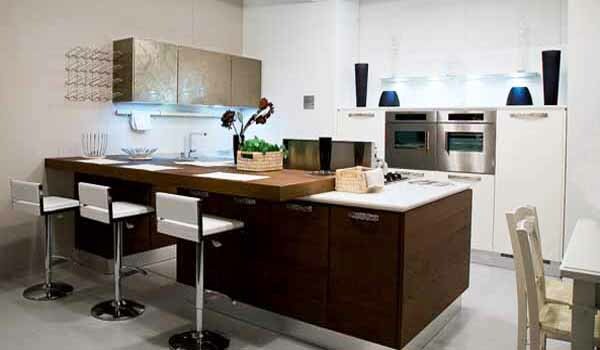 Here are 16 modern kitchen trends 2013 that will help select the best kitchen designs for your homes, wisely spend mony on kitchen renovation and save money on kitchen redesign, while creating impressive and stylish, comfortable and functional, pleasant and inviting kitchen interiors for modern lifestyle. 9. Custom made kitchen designs in Art Deco, classic or country style, that combine beautiful wood and glass, stainless steel and leather like materials, unique furniture, stainless steel appliances or retro stoves and crystal lighting fixtures, are latest trends for 2013 exclusive kitchen interiors. 10. Modern kitchens in classic style, white kitchen cabinets and dining furniture with carved wood decorations, open shelves and ceramic or glass decor, retro kitchen faucets and wooden kitchen island designs with dining peninsulas are timeless design trends that in 2013 will be popular, appreciated and enjoyed by many people. 11. 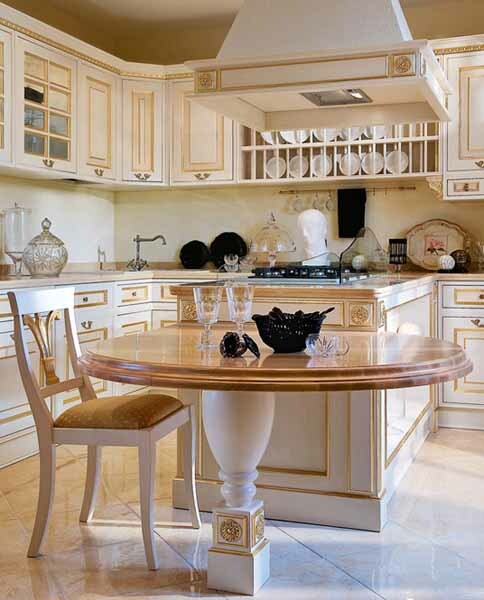 Solid wood kitchen cabinets and exotic woods for interior decorating create luxurious modern kitchens, spiced up with crystal chandeliers and enhanced by dining furniture, made with upholstery fabrics that match colors and mimic textures of granite or marble countertops and kitchen islands tops. 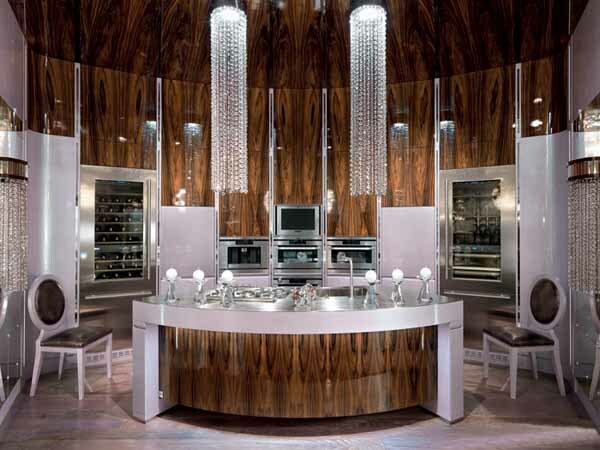 Neutral and rich colors, strong contrasts, crystal lighting and matching horizontal surfaces are gorgeous and impressive kitchen design trends 2013 that will add the bogemian chic to modern kitchen interiors in classic style. 12. 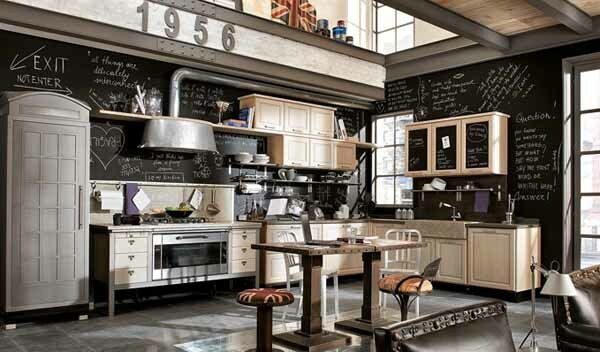 Retro kitchen designs in 50s and 60s styles with classic kitchen cabinets, vintage furniture, redesigned and repurposed decor items or lighting fixtures, mixed with decorative accents in steampunk style, are the most exciting and creative kitchen design trends for 2013. Unique retro decor ideas, like a retro fridge that reminds of an English telephone box, old posters and storage boxes, combined with blackboard paint and retro lighting fixtures, create familiar and surprising modern kitchen interiors with nostalgic flavor. 13. 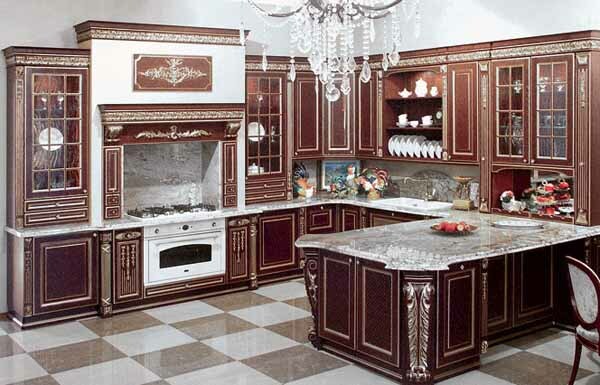 3d textured wall panels and abstract decoration patterns are latest design trends in kitchen cabinets, islands and wall designs. 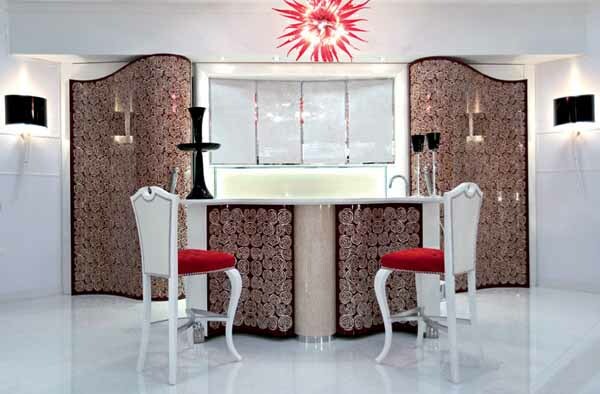 Unusual shapes demonstrate surprizing and creative 3d design trends in dining furniture and peninsula designs. 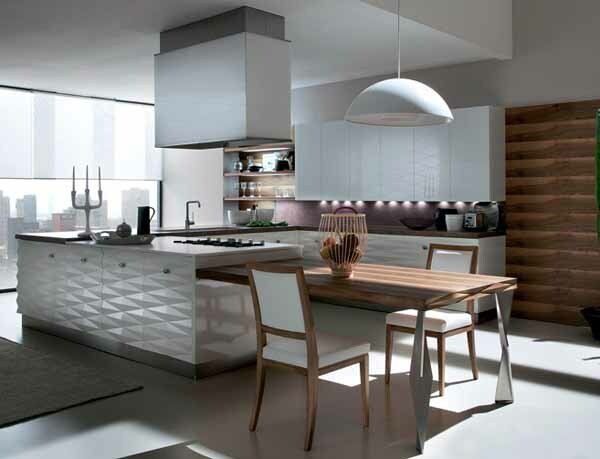 3d wall panels and textured surfaces of kitchen islands and cabinets are emphasized by exciting shapes of peninsula supports, giving an artistic touch to impressive contemporary kitchen interiors. 14. The combinations of various materials and styles, straight and curvy lines, flowing shapes and classic designs, strong contrasts, created with bold accents and neutral interior decorating colors, and impressive decoration patterns, textured decorative surfaces and unique lighting fixtures are stylish ways to bring the eclectic style into modern kitchen interiors, reflecting modern interior design trends 2013. 15. Functional and attractive modern kitchen designs with large dining tables, made of solid wood, rustic or simple contemporary dining chairs, wooden kitchen cabinets and shelves with functional lighting, built-in stainless steel appliances, safe and convenient kitchen cabinets doors without sticking out handles or knobs are ideal, warm and practical kitchen design trends 2013 for families with kids. 16. Thick large pieces made of solid wood that connect different elements of the kitchen design, ( the low cabinets and kitchen islands,) is the simplest and brightest of modern kitchen design trends 2013 that allows to adjust kitchen interiors to your family needs, redesign the space and make modern kitchen interiors multifunctional, adding a comfortable working surface or creating a dining or studying area in small kitchens.